John 10:11(AMP); I am the Good Shepherd. The Good Shepherd risks and lays down His [own] life for the sheep. Every good shepherd risks and lays down his own life for the sheep; he lives selflessly for the good of the flock. Moses was a man with a shepherd’s heart. While pleading the cause of Israel before God, he said, “Oh, this people have sinned a great sin, and have made them gods of gold. Yet now, if thou wilt forgive their sin–; and if not, blot me, I pray thee, out of thy book which thou hast written.”(Exodus 32:31-32). Christ the ultimate pattern gave up His life for His sheep at the cross. Moses had a rebellious Israel to deal with but he was willing to have his name removed from God’s book for their sake; Paul had religious and legalistic brethren to deal with but he could readily bear a curse for their sake if it meant their salvation; the Christ went so has as to die for us while we were yet sinners (Romans 5:6). The people you lead may not be perfect; they may be difficult, demanding and sometimes excessively entitled but God requires us to live selflessly in our service to them. The heart of the shepherd is one that is ready to be a substitute in the face of punishment; like Moses was to the Jews; like Paul was to Israel and like Christ was to us. This attribute of the shepherd’s heart is the foundation of the ministry of love that always seeks to cover a multitude of sins(1 Peter 4:8). 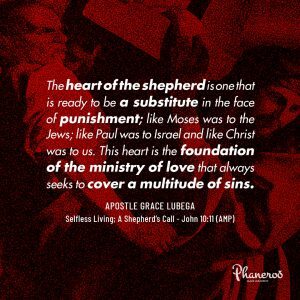 The heart of the shepherd is one that is ready to be a substitute in the face of punishment; like Moses was to the Jews; like Paul was to Israel and like Christ was to us. This heart is the foundation of the ministry of love that always seeks to cover a multitude of sins. PRAYER: My God, I thank you for this Word for today. The Word makes a minister of me in my circumference of influence. I carry the shepherd’s heart for those you have placed under my influence. I serve you Lord in the beauty of sacrificial living for their sake; Like the Apostle Paul, I am alive for the sake of men, to the glory of your name. Amen.